Brockley: Looking for fruit trees and bushes to glean! Wild Brockley are local jam, chutney and preserve specialists. They are looking for pears, apples, quinces, crabapples, rosehips and any other fruit that is edible and in season now. If you are all chutnied out, and have fruit that still needs harvesting- do getin tough with Moira and Elizabetta. SE Plenty Free the new Lewisham foraging group have a announced a series of foraging meet ups for the next week. Do call - text - email for more details & do bring your own bags! SUN 13th Some of us are heading over to One Tree Hill / Brenchley Gardens early afternoon, to look for sloes (to make gin) and some late blackberries. Contact me for meeting place. SAT 19th PM: We will be meeting at the Honor Oak Aerial site and visiting a nearby garden which had 6 different varieties of Apple trees. Bring picking picks if you have, or can borrow. Clockwise from the Left: Elderberries, rowans, rosehips, blackberries, white rowans and hawthornes. Be careful where you pick! When we go foraging we stay well away from roads,- you dont really want to be eating food that has grown alongside a busy road. Even a thorough washing may not remove all the dirt and chemicals the fruit has been exposed to over a long perid of time. This fruit heavy bramble is in a quiet cut through I only know is there because of hide and seek games played as child. Hawthornes- these dont yield much berry juice- even if you pick kilos! Its best used as an ingedient alongside other hedgerow berries. It does give lots of colour. This elderberry bushe had it's top lopped off several years ago and so helpfully, it's elderflowers and berries are conveniently at head height. Try not to pick from low branches which may have been sprayed by dogs and foxes. In some popukar dog walking areas several hundred dogs may mark a particular spot in a week- you dont want to be eating that! Finally - dont be greedy! Take as much as you need, but try to spread you pickingc over several sites. Leave some for the birds and for other foragers. Make sure you know what you are picking. The kids picked the large brown berries at the top of the picture and we have no idea what they are, and so they'll be put aside until we can get an ID. If one isnt forthcoming, they'll go into the compost. UPDATE: The brown berries belong to the wild service tree, .they are edible but only after tenderised by an extended periode of cold. Tp the compost it goes! These are open maps stated by local Transition Town teams, everyone can contribute to them. So why not be neighbourly and help out a fellow forager by sharing some of your favourite spots? At Cafe Crema we are developing an urban orchard and using the process as an opportunity to provide training for the community. We have a planting and workshop day coming up on April 7th with the incredidible, enthusiastic and knowledgable Paul Richens, Head gardener at The Kings Cross Skip Garden and trainer for Capital Growth. Workshop session: indoor workshop led by Paul covering choosing fruit trees and understanding root stocks, finding suitable trees for a new space. Practical session: Planting out some hazel nuts/ gooseberries and plums in the Cafe Crema Secret Orchard. There will be free tea and coffee available and participants are also welcome to bring their own lunch or buy lunches from the Cafe. Thanks to London Wildlife Trust for funding this day! Sydenham Garden has announced three workshops to be held at its de Frene Orchard (Located off De Frene Road in Sydenham). The sessions will be led by London Orchard Project. Booking is essential. Fee: £15 to cover costs. Please complete this Application form. This will also be a chance to see the de Frene site and learn about plans to make it a successful food growing area. Information passed on by Alona, Chair of Friends of MAyow Park. Volunteers wanted at the Iona Orchard, Ladywell SE4! The last of three sessions run by the London Orchard Project will take place this Sunday, 10.30am-15.30pm. Robert Sheppard, Secretary of The Ladywell Fields User Group will be heading up the volunteer group planting out several heritage varieties of fruit tree at the new Iona Orchard. This overgrown Ladywell orchard was renovated and repllanted in 2011 with the help of the London Orchard Project. If you plan to go along and support the group, please email [email protected] Wrap up warm and meet new people! New Apple Variety for London - naming competition! A new Apple for London- Your chance to name a new apple variety! We’re planting one hundred of the new trees in orchards in public spaces, parks and schools across London throughout the month of December 2012 and if you would like a new apple variety in your community orchard or area, let us know. We have worked with the lovely nursery, ‘Trees for Life’ who have supplied many of our fruit trees to create this variety. It was nurtured from a single seed and has taken ten years to develop. The parents of the tree are the Pixie apple, introduced in 1940 and the Laxton Fortune apple, introduced in 1904- both of which are known for their strength and disease resistant qualities. In addition to its robustness, this tree will also produce high numbers of sweet, flavoursome apples. 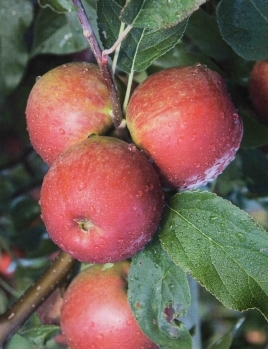 The apple will be the first London specific variety to have been developed since 1953, when the Merton Delight was born. If you can think of a name for the new London variety, Tweet your suggestions to @LondonOrchard then follow us on Twitter, for the announcement of the winning title. You can also email suggestions to [email protected] – and you can make your mark on Britain’s apple history!